Narcissists are some of the worst when it comes to relationships. They tear their partner’s apart and are not kind like you’d expect them to be from the start. While you might begin on a good note, the longer you are with a narcissist the worse things will become. While they hold tons of positive qualities those qualities begin to dissolve as you get closer and closer. The mind of a narcissist is full of delusions, they think they’re doing the right thing by forcing you down a rabbit hole of confusion and oftentimes cannot be helped. Don’t get me wrong, sometimes they can be amazing people and build up those they care for but almost always the opposite will end up occurring sooner or later. They can turn you into a shell of who you once were and I believe far too many don’t realize this until it is too late. Through deception, narcissists will force you to become someone you never thought you would be. The narcissist will come in and sweep you off of your feet and leave you feeling like the most special person in the world but all of that changes far too quickly. They will ease your pain only to cause more and support you only until it doesn’t serve their purpose anymore. They go from the person you feel the most secure beside to the person making you walk on eggshells. Narcissists are masters of tons of different psychological tactics and so forth that they will use to beat you down time and time again if you remain within their lives and allow them to control you. They will not limit their cruel words or allow you any boundaries. Because they believe the things they do are fine, and they believe the lies they speak, getting through to them is next to impossible. The narcissist wants you to feel like you have no one else, and he or she will want to bring you down to the lowest you’ve ever been. You won’t be able to find any sense of happiness with someone of this nature around and that is something you should remember. Just because someone seems perfect doesn’t mean they are, ‘too good to be true’ holds through this kind of thing in an extreme manner. Narcissists live in a world of delusions, and they refuse to see anything other than what the feel they should. You cannot begin to comprehend the things locked within their heads and to be completely honest, you shouldn’t want to. Narcissists feed off of those they feel are weak and so allowing them more time in our lives than we should is devastating. The only way to truly protect yourself from this kind of thing is to be on the lookout for it. Don’t let someone stick around once they being hurting you or bringing you down. Sure, no relationship is perfect but you should never turn yourself into a punching bag willingly. 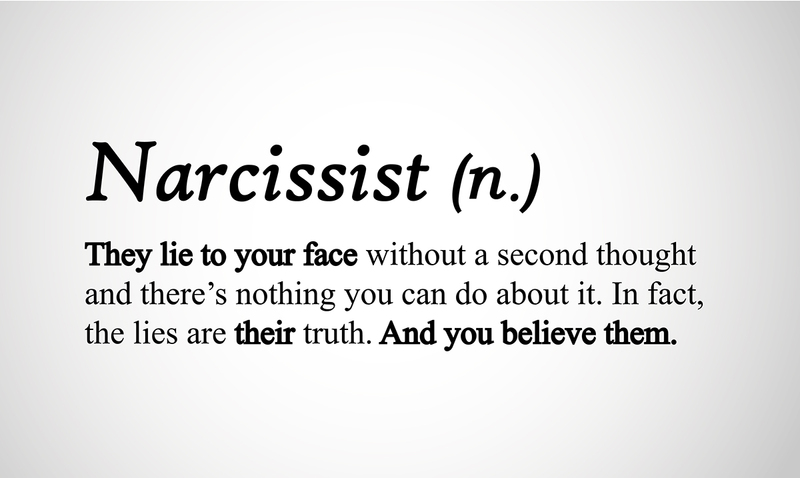 To learn more about narcissists, in general, please feel free to check out the video below. You do not have to allow this kind of thing in your life.